The Banbury<sup></sup> collection sets a tone that is both classic and sensible. Easy 2-Step Installation. Does not require behind-the-wall access. Banbury 5-Function Wall Mount Showerhead in Spot Resist Brushed Nickel The Banbury<sup></sup> collection sets a tone that is both classic and sensible. Banbury 5-Function Wall Mount Showerhead in Spot Resist Brushed Nickel is rated 4.5 out of 5 by 36. Rated 5 out of 5 by Boulder from Great shower In addition to the other reviews, I would point out that the included hose is very flexible. The other brands often have hoses that fight you as you use the wand. Rated 4 out of 5 by PistolPete from Bought 3 of these It was easy to assemble and works very well. It improved our water pressure. Rated 4 out of 5 by Cathy from Banbury 5-spray showerhead Love the showerhead and different sprays available. Rated 5 out of 5 by TomM from Banbury 5-Spray 4 in. Showerhead Replaced a similar, but plastic shower head that had cracked. Prefer the all metal. Doesn't break. Looks correct and functions fine. Rated 5 out of 5 by Savwich from Good showerhead. Easy to install. Easy to install with only finger tightening and teflon tape required. No leaks when first installed. Flow is very adequate to remove soap/shampoo easily. Adequate adjustments up/down and left/right. Spray pattern adjustments are also easy to change. Only recommendation would be to indicate that the teflon tape is included in the packaging. Was unaware of it so purchased an additional roll. No big deal, but it should be included in the description. Would buy another one. Rated 4 out of 5 by LHV from BANBURY 5-SPRAY 4 IN. SHOWERHEAD The product was easy to install and there were no problems. 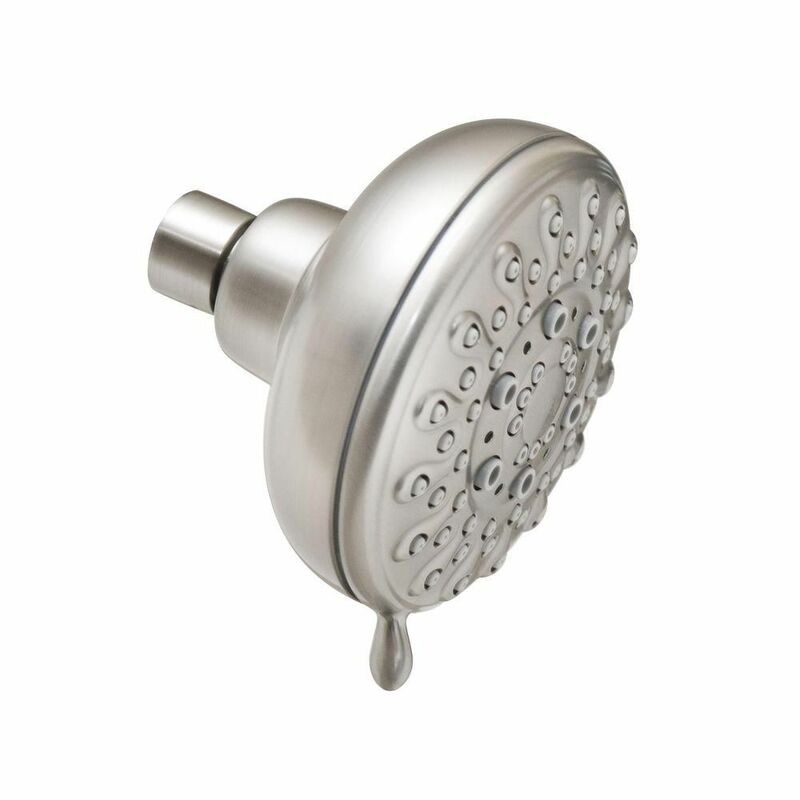 The showerhead operates as described and it is easy to switch from one spray to the next. If I needed to replace another showerhead I would be willing to buy another one. Rated 5 out of 5 by Philanna from Great product! We are senior citizens and use the lighter spray mostly. Our old showerhead had only one adjustment. We recommend this product. Rated 4 out of 5 by Jennifer from Good for the price We've had this in our main shower for about a month and it is working great. Changes spray pattern easily and has good coverage. Very easy to install. Installed with a flow stop connector and very happy. It was not the most expensive and not the cheapest, good value for look and performance.